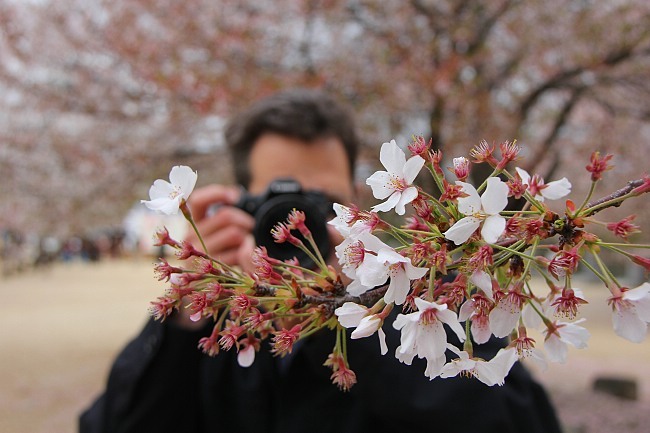 It was a rainy day in Matsuyama as I visited the city's cherry blossom spots with Schauwecker. 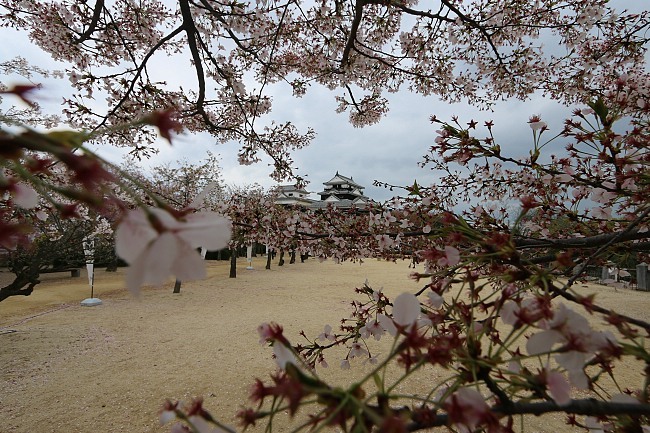 The cherry blossom season started in Matsuyama this year on March 24 and peaked five days later on March 29. 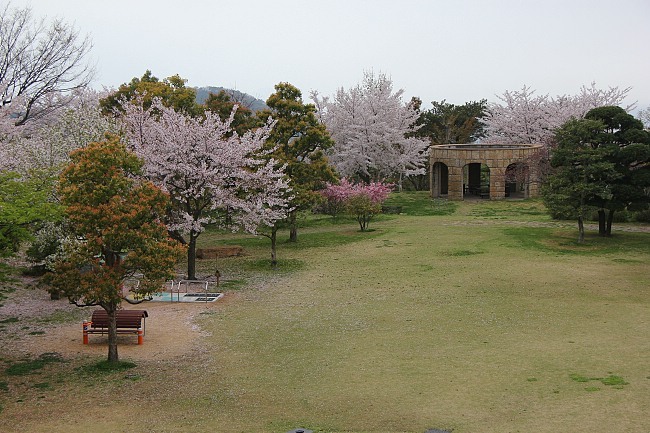 Although the cherry blossoms were on a decline by the time of our visit, we were nevertheless able to catch some pleasant views. 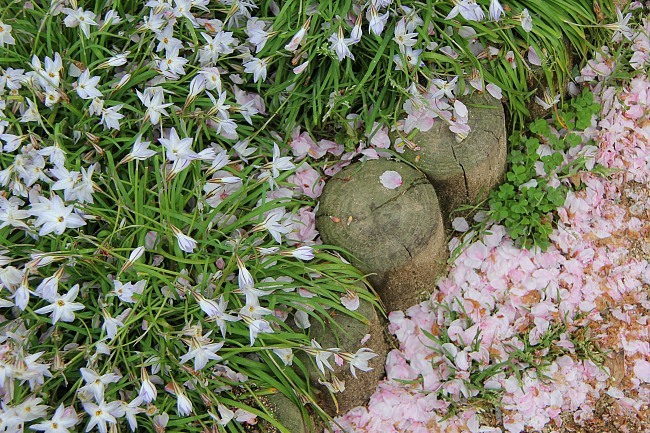 However, with the afternoon showers in the area, more petals will fall and that would bring the season closer to its end. 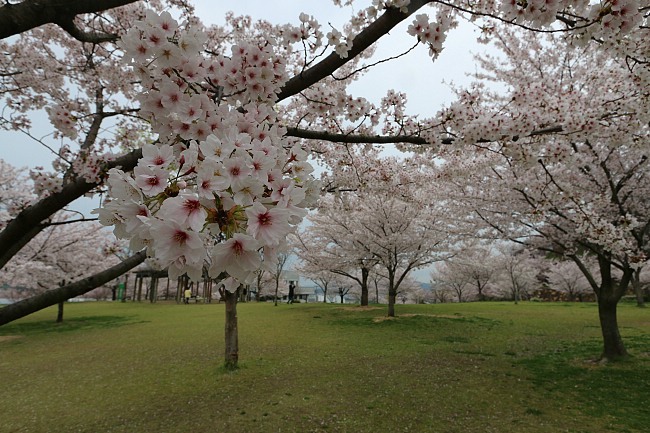 Elsewhere in Hiroshima, Raina reported that the cherry trees were also quickly losing their flowers, so visitors hoping to catch the closing stages of the season there had better hurry. 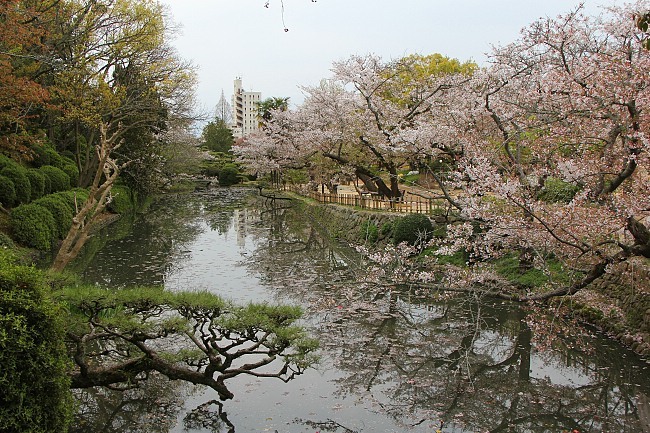 The spacious Dogo Park is located just a short walk from Dogo Onsen, a renowned hot spring town featuring the iconic Dogo Onsen Honkan bath house. 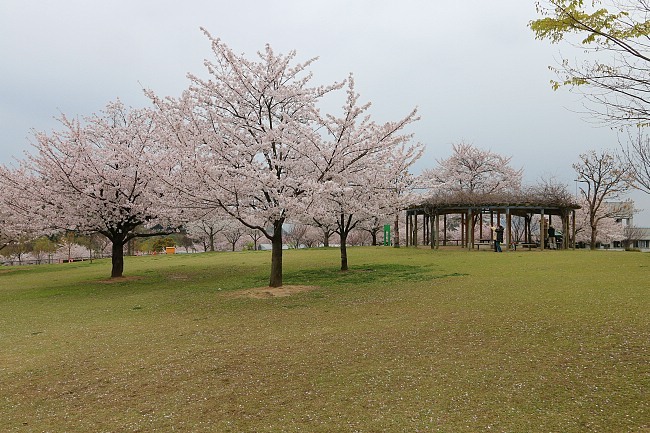 As we arrived at the park in the early morning, the usual crowds that come here for cherry blossom viewing (hanami) had not yet turned up, although there was a group already setting up their barbecue grill - having a barbecue in combination with a hanami party is quite common at this park. 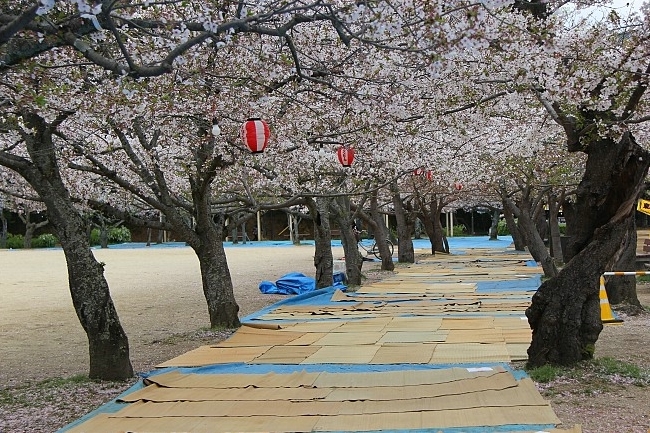 In anticipation of the hanami parties later in the day, there were already many mats with names written on them laid on the lawns under the cherry trees. 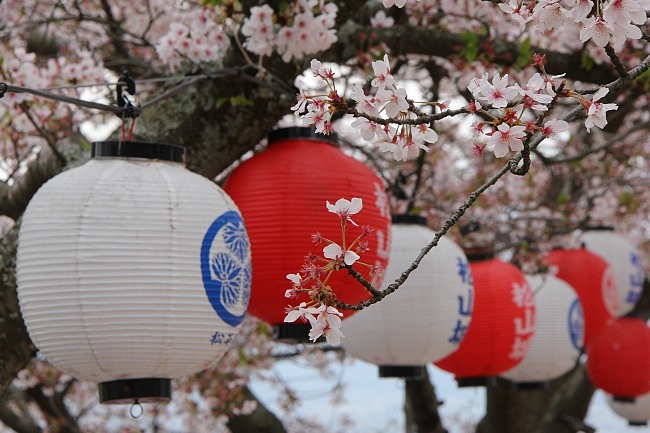 Unfortunately, this weekend is probably the last chance for visitors to see cherry blossoms here this year, for by the time the weekend is over, the cherry trees will likely provide shade with more leaves rather than with flowers. 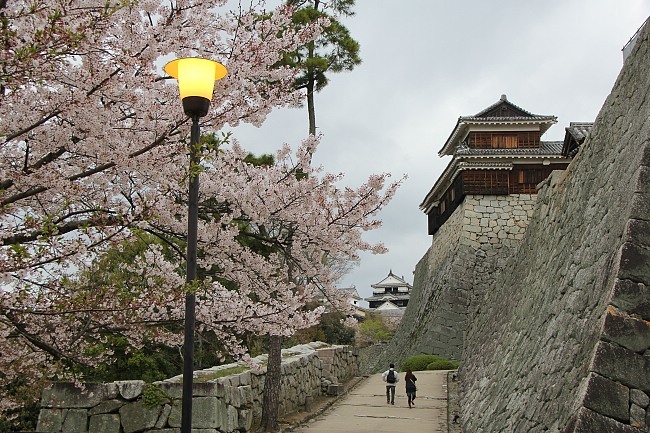 This is one of the best castles in Japan, featuring a main keep that has several secondary castle buildings adjoined to it. 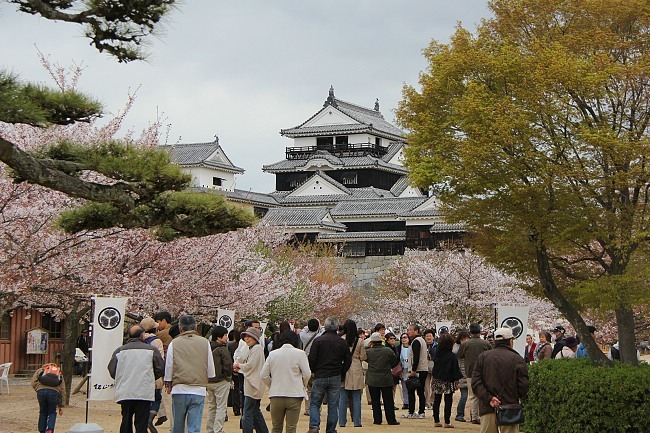 In spring, the beautiful Matsuyama Castle turns into a great cherry blossom spot as the hundreds of cherry trees standing on its compound burst into a pinkish-white. 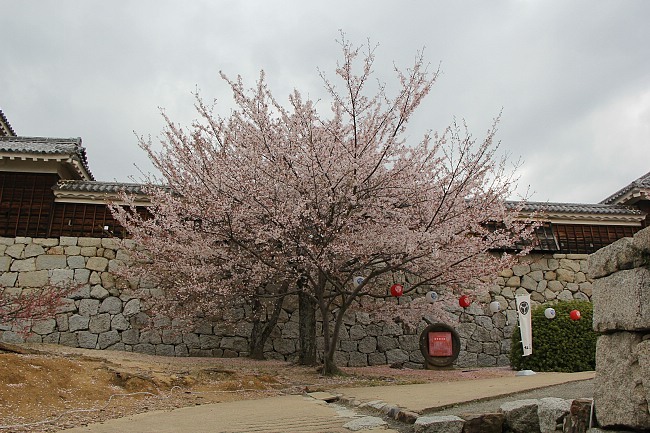 This year however, we missed the best viewing period for the sakura, as the majority of the cherry trees had already shed many of their petals, and I am afraid the season will not last more than another couple of days here. 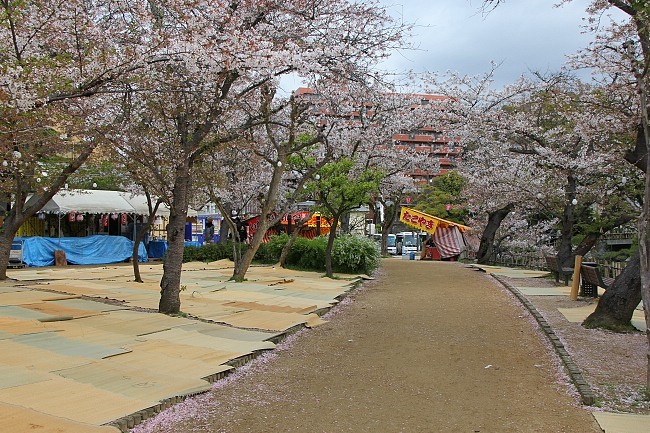 We unearthed a gem of a hanami spot in the Matsuyama Sogo Park. 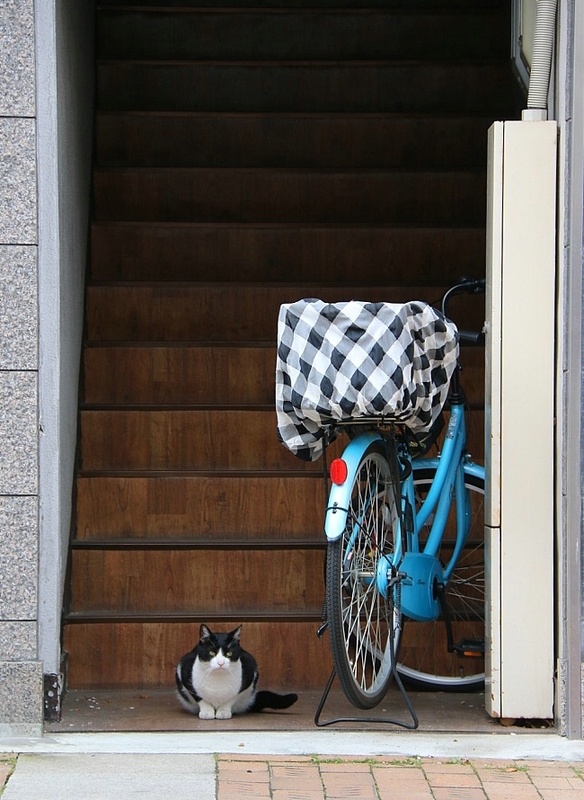 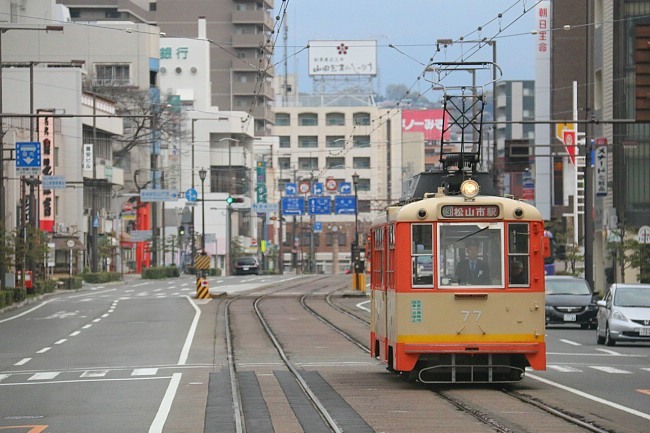 The park is located on a hill about one kilometer west of Matsuyama Station. 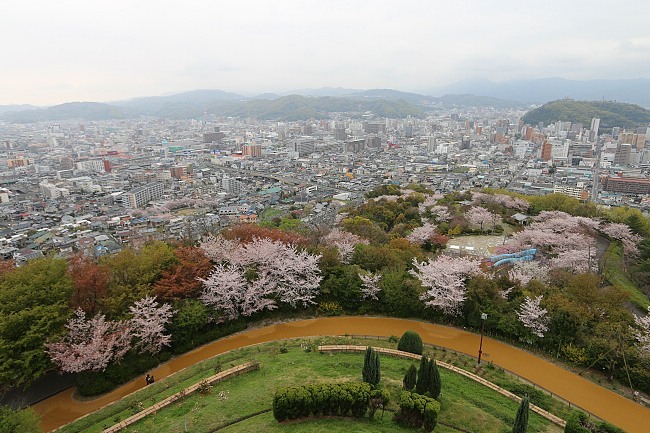 Besides enjoying the hundreds of cherry trees at the park, visitors can also revel in great views looking onto the city and of Matsuyama Castle in the distance. 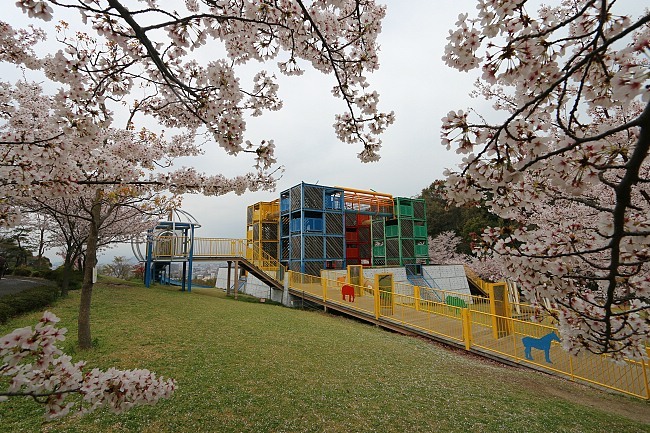 Here, there are also spacious lawns for picnics and a huge jungle gym playground that turns adults green with envy. 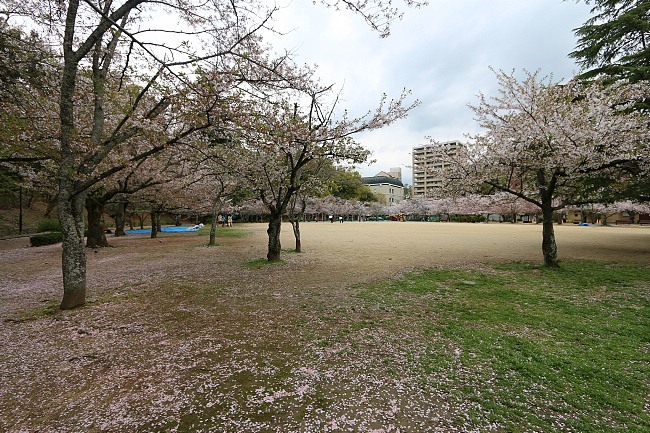 Interestingly, the state of the cherry blossoms here today was much better than that at the previous two locations. 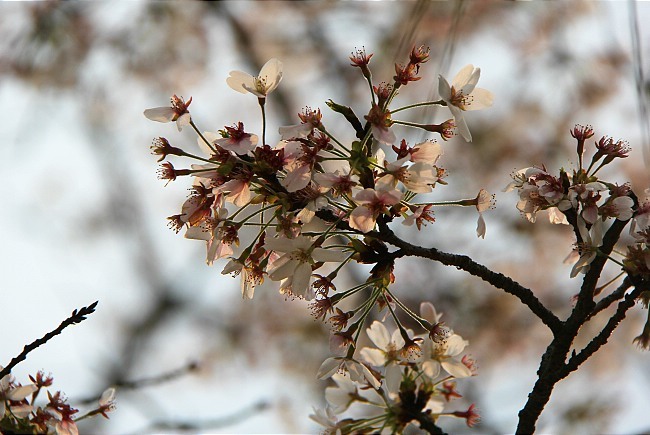 The cherry tree branches were shedding their petals too, but overall the trees still had pretty full crowns. 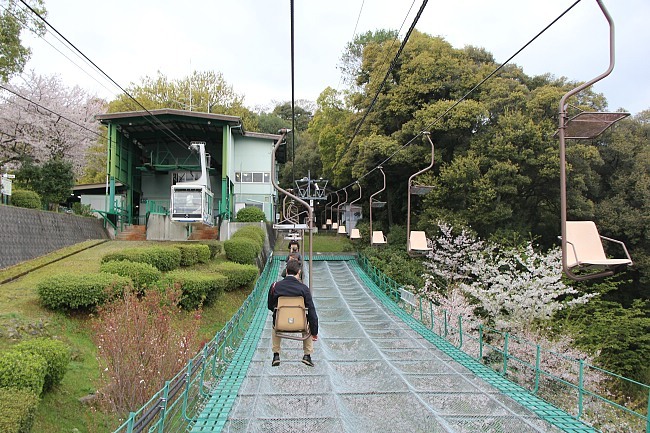 Should you happen to visit Matsuyama in the next few days, this would probably be your best bet for some pleasant cherry blossom views.